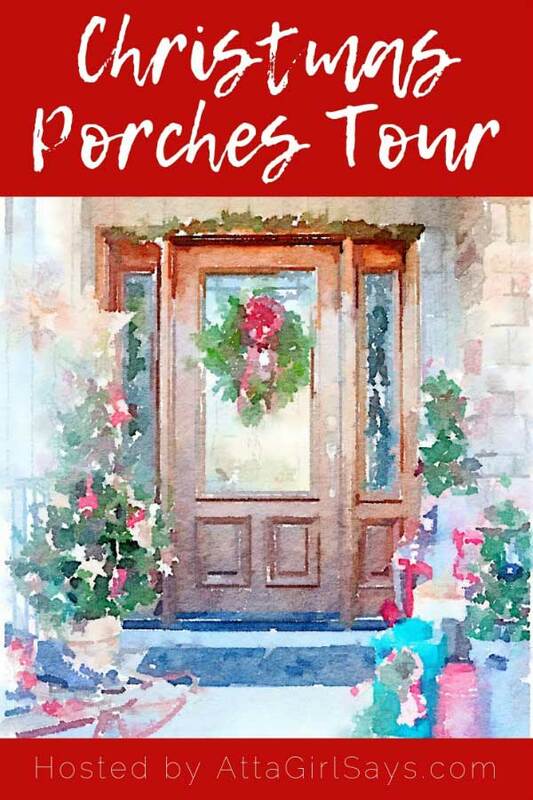 Today is Christmas Porches Tour day!!! 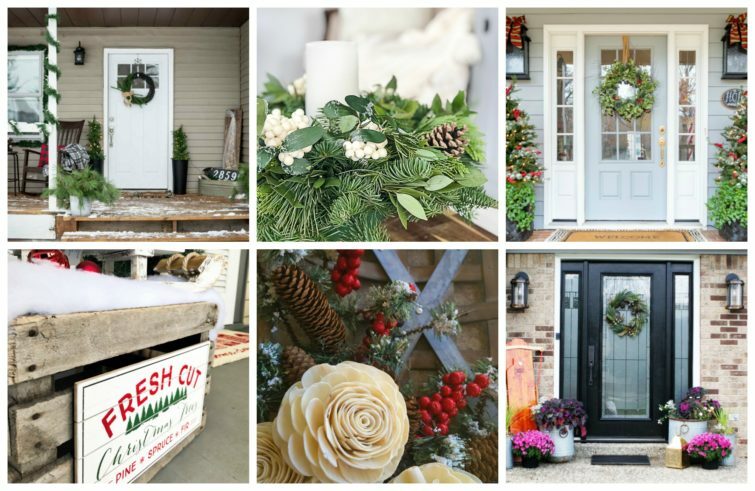 It’s the day I get to team up with some amazing bloggers to show you what we’ve been up to on our porches for the holiday season! I am so EXCITED! And if I’m being honest, a little bit scared! This is the only official tour I do for the holiday season and I always want to put my best foot forward. But my best foot might just involve a few blowmolds and I know kitschy vintage pieces aren’t everyone’s thing. Gasp. And then I got to thinking (I do that sometimes), that I want to show you how you can use some retro pieces mixed in with your rustic or traditional decor and have something sort of special. And not in the “Bless her heart” sort of way, but in the “Good golly, she’s convinced me to dig grandma’s blowmolds out of the basement” sort of way! At the end of the post you will see links to the other bloggers’ porches. Use your more rustic or traditional decor as the base and then add in a couple fun and funky retro pieces as the accents. It will probably be easiest to set up the entire porch with the rustic decor first and then add in the retro goodies second. That way your mind isn’t going back and forth when trying to see what looks good together. One design era at a time, people. Flea markets, thrift stores, estate sales, antique malls, Etsy and Facebook Marketplace are all excellent places to find retro Christmas decor. Add a little bit of whimsy! Retro Christmas decor was fun, bright and a little bit funky and a lot of the time it was plastic. Don’t shy away from plastic! Just go for it! It’s easy to second guess yourself when all you see right now on the internet is gray walls and shiplap, but if you want to dive into a little retro Christmas decor, dive in the deep end and don’t worry about your beehive hairdo getting wet. 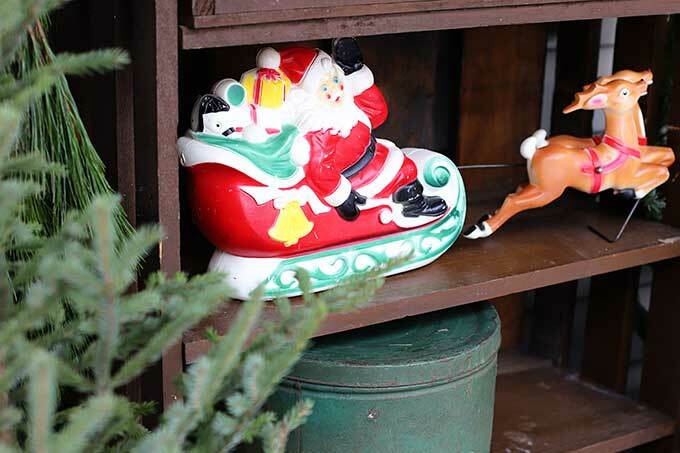 This small blowmold Santa sleigh and reindeer is a fun vintage piece. He’s very nostalgic looking. As are the vintage blowmold candles. I wasn’t 100% sure I was going to put the candles on the porch or not. I bought them a few years ago and I generally keep them on the back porch at Christmastime, but I thought they would UP the kitschy Christmas factor out front this year. So I promoted them to the front porch and am so glad I did! 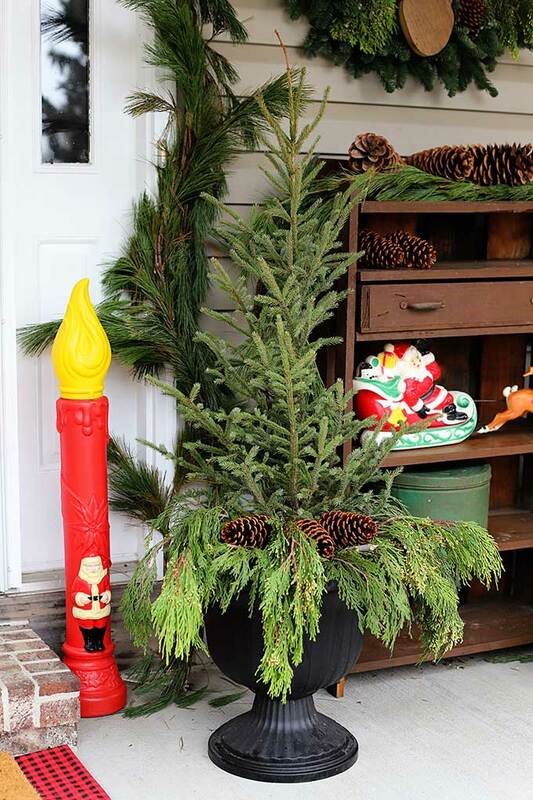 By the way, a tutorial for the porch urns can be found here – Easy Holiday Front Porch Planters (and as the name implies, they really are that EASY to make). 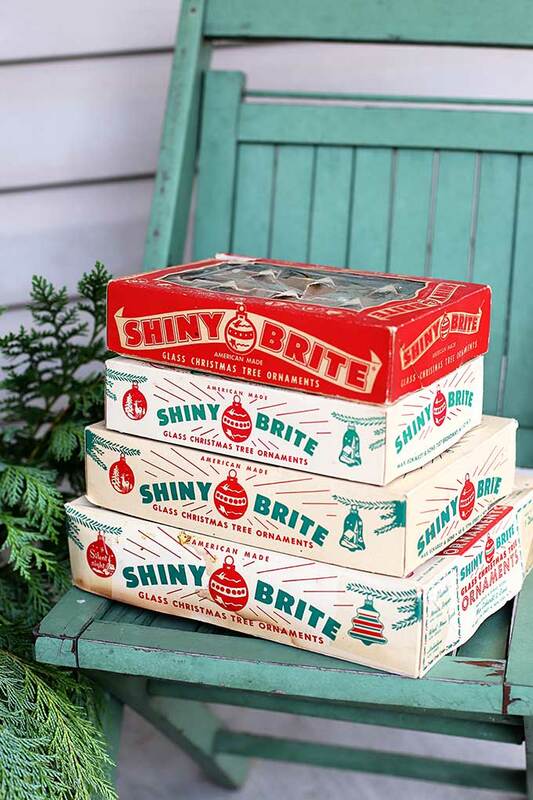 You can’t go wrong with a stack of Shiny Brite boxes. Ever. I joked on Instagram that these only lasted on the porch long enough for me to take photos, because, although everything else is on the porch is there for real, these were here just as “props”. Not going to leave my babies out in the cold, wind and rain! On the other side of the porch I put the second candle along with a sign I made a few years ago. 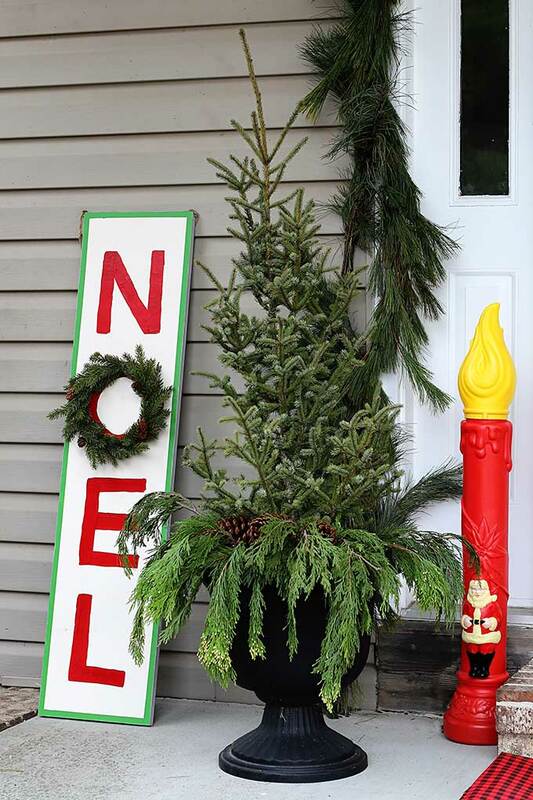 I didn’t bother to make a tutorial for the porch sign, because it’s basically a piece of wood I bought at Home Depot painted with the word NOEL and a wreath hung around the O. Simpler than simple. I hung fresh greens around the doorway. It’s takes about 20 feet of pine garland to go from one end of the doorway up around and over to the other end of the doorway. Since the local garden center had 25 foot rolls of garland at a good price, I used the extra 5 feet to drape over the top of my brown wooden cabinet thingie. 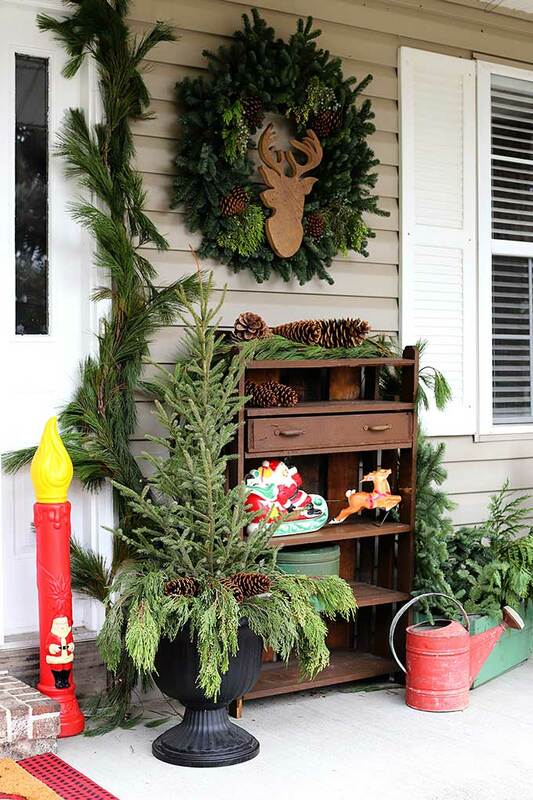 I first showed this shelf on my fall porch – Simple Fall Porch Decorating On The Cheap. The HUGE pinecones on top of the cabinet are sugar pinecones. Sort of hard to see in the photos, but they are pretty impressive as far as pinecones go! I found the deer head silhouette at a local craft sale a few months ago (I link to a similar one in my “Where To Buy Christmas Porch Decor Online” section below) and wired it to a behemoth live winter wreath. It’s 36″ wide across and fits perfectly in this space between my door and window. 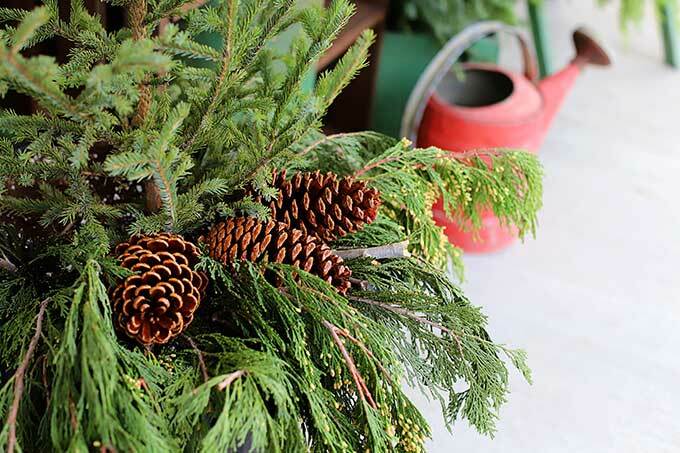 And then I placed some bundles of live winter greenery (mostly cedar, spruce and holly) in a galvanized tub in front of the porch and in the green wooden box beside the cabinet. I think I may have put the garden center owner’s kid through college with all my greenery. Seeing as how we have at least 7 huge pine trees in our yard, I probably could have gone the natural scavenge-for-yourself route, but I love the variety of greenery at the local mom and pop garden center. And don’t forget I also have an Amazon shop where I list a whole bunch of Christmas goodies! 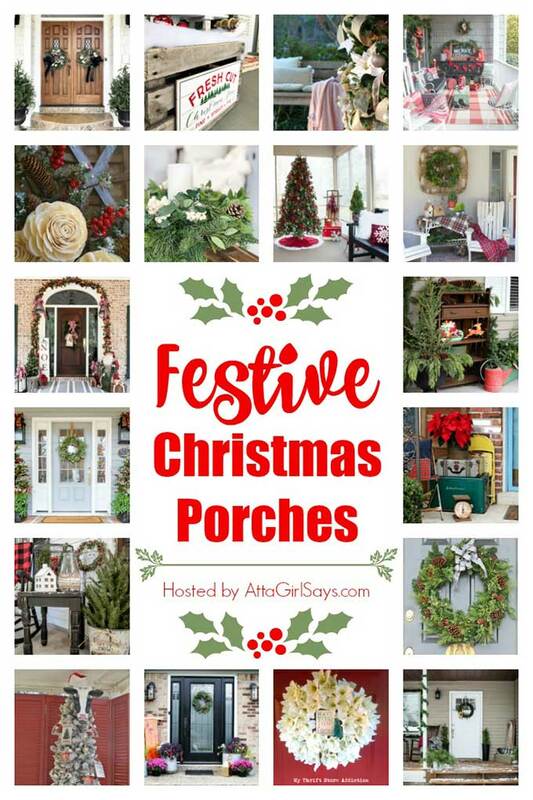 Now scoot on over and see what everyone else has done to their porches this year! I look forward to seeing your Christmas porch every year, Pam. 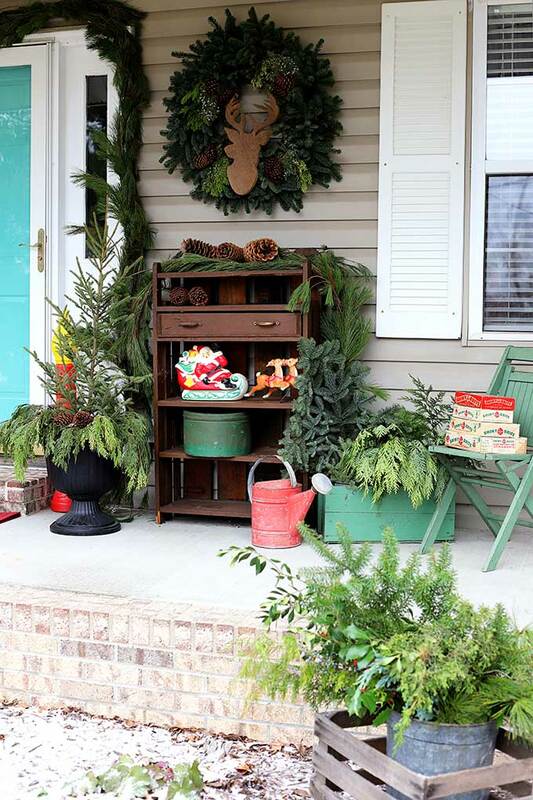 This year’s porch is vintage perfection. I love every single detail and admired all of it over my morning coffee. Thank you Paula! If you’re missing that glorious red Coleman cooler one morning, you’ll know where to find it! I absolutely love your blowmolds! I have never seen the candle ones with a santa on them. Great find! Thank you! I found them a few years ago. It was the first time I had seen the Santa variety before! I saw a whole bunch of them for sale in a booth at the Country Living Fair last year, but the prices were astronomical. I don’t think I’ve ever spent more than $5 for one at a yard sale! I envy your porch in the kindest way possible. I have a stoop, so I am always dreaming of a day when I will have a porch. But you have a picket fence!!! A picket fence is almost as fun to decorate, right? Pam I love seeing your porch for the Holidays. I love all your mix of retro things. Just brings back so many great memories. I love it all so festive and pretty. Have a great new week. Thank you Kris! I was just checking out your fabulous party! The planning and attention to detail you go to with that is amazing! 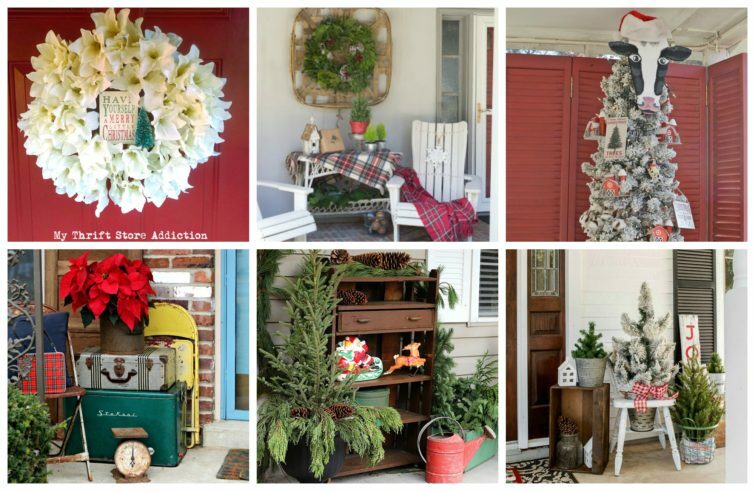 I always love your porch decor, Pam…and at Christmas it is always even more special! Love the whimsy! I need to make a NOEL sign! Thank you Linda. I really do enjoy playing around out there! You are so sweet! So glad you are part of the porch tour! 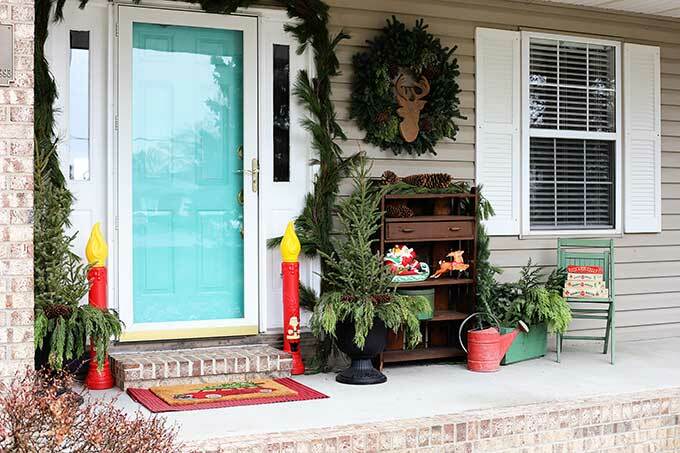 Your porch is fun and festive. I love everything about it. You did a great job. I think my favorite thing has to be those black urns. I love those urns too! And they are plastic! I bought mine at Lowes, but they have the same ones on Amazon. When I bought them I was thinking “Oh, if they last a full year I’ll be happy”, but it’s been 4 years now I think and they are still looking good and haven’t lots their color at all! I love your porch it just screams vintage holiday porches, so pretty. Pam, your porch is so pretty and fun. I love your porch pots. And all of your charming vintage items are just perfect, especially the green pieces. Love it all. Thank you! I LOVE making those porch pots. I try to do a different version every year! Pam, I always love to see how you’ve decorated your porch each year. You do have the unique gift of displaying vintage items to perfection. 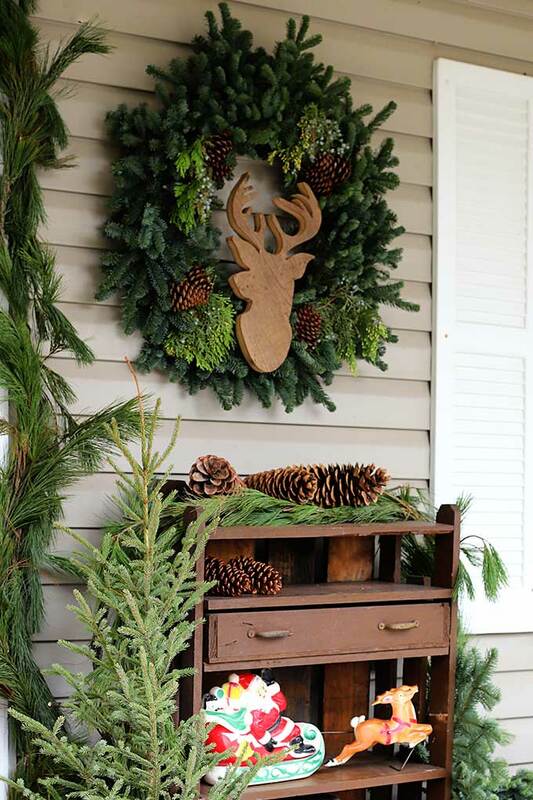 I also love how you use natural items, and I really wish I’d added real garland around the front door after seeing yours! Oh, but your porch is AMAZING as is! I used to have a huge cow collection, so I loved your theme this year! I was THISCLOSE to buying some retro candlesticks for my porch this year, but the pricetag scared me away. I’m gonna cross my fingers that they’ll go on sale, and I can get them for a steal! I love your colorful, kitcshy space exactly because it is unique and creative and not like every other square I see on Instagram! And I just had to laugh about your comment about putting the garden center owner’s kid through college. I’m pretty sure there’s a pumpkin patch kid getting an Ivy league education thanks to me! And this year, I did splurge on some greens. We should probably plant and grow these things ourselves, but who needs more work, right? Thanks so much for being a part of the porch tour again this year. Thank you for inviting me! 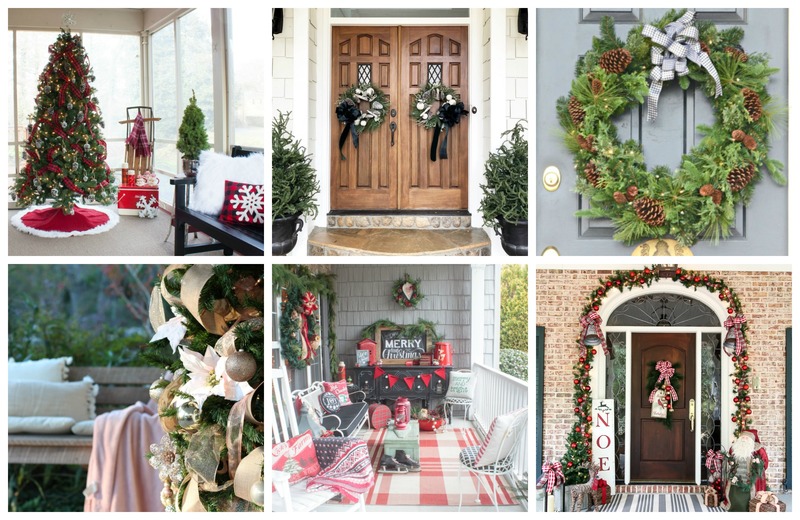 I look forward to seeing what every is doing on their porches each year! You KNOW that I love your style, Pam. Always creative with a vintage twist. 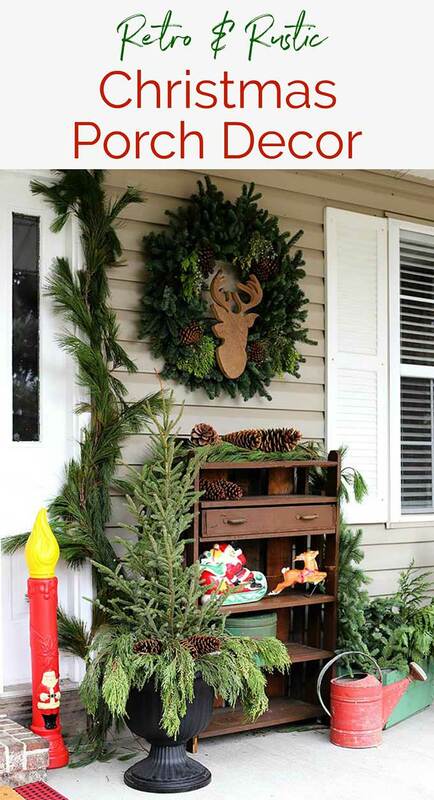 Your porch is a perfect welcome for your Christmas visitors. Thank you Meegan!!! That means the world to me! Very pretty. I also like the colors of your house the siding and shutters. And I use to have candles like that. I love the bench/shelves. I’m looking for something like this to put in my kitchen area to display some of my favorite Christmas dishes. After downsizing for retirement I had to give away my large hutch and now have nowhere to put all these favorites. I too like the retro look and have a collection of Napco girls from back in the 50’s and 60’s. your rustic and retro takes me back to my childhood. love it! ha. next time go into your yard for your greens and send the money you saved to me….so i can put my own kids through college. 🙂 Happy holidays. Your front porch is great, Pam!!! I didn’t know that is what you call those old 1950’s/1960’s/1970’s plastic light-up yard ornaments… blowmolds. 🙂 Learned something new today! Thank you. <3 I wouldn't leave my Shiny Bright boxes and ornies out, either. Too cute! And i love the brown shelf cabinet out there; it adds a nice touch. p.s. Didn't you do a cute Santa and reindeer outside last year??? Maybe I am thinking of someone else but seems to me I really like your porch last year, too. 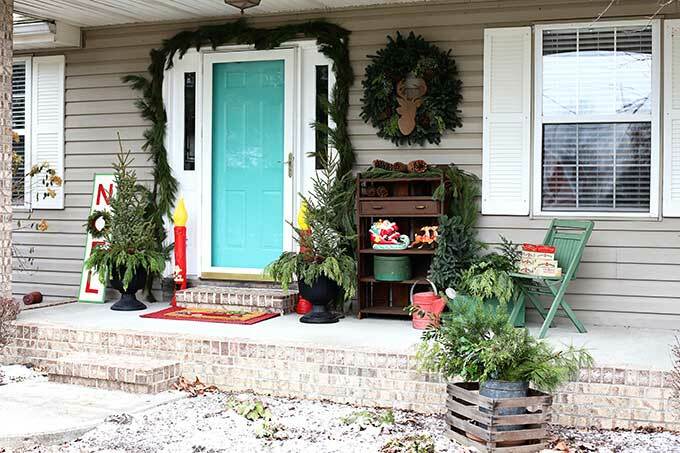 Pam, your porch is holiday perfection! I love it all! It was fun touring with you this week! Pinning! Really cute, Pam! I love how the brown shelf and greenery ground it all and the bright, retro pieces add the pop! So fun to use all those vintage finds for Christmas, isn’t it? Pam, your porch has been a favorite of mine for years! I just love your vintage finds. I love how you went very neutral and rustic with your greens and let the vintage decor be your pops of color! Vintage perfection! So fun to see the candles — we had some like that when I was growing up. I love all the natural greenery and the stack of shiny bright boxes is a simple, charming detail.